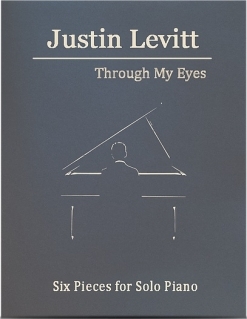 Through My Eyes - Six Pieces for Solo Piano, Volume 3 is the third in a series of eight sheet music books composed by award-winning SF Bay Area composer Justin Levitt. Each volume contains six original piano solos, and each solo is very different from the others. 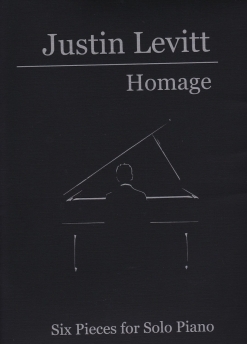 There is a description of each piece near the beginning of the book that gives the pianist insight into what the composer had in mind when he wrote the music. There are also extensive notes within the sheet music that tell specifically how to create various effects by pressing down on or plucking strings and altering the sound by using the pedals. All of the playing instructions and expression are written in English and the pedaling is marked throughout the book. I really enjoy playing all six pieces, from the lyrical and beautiful “Through My Eyes,” “Oui” and “Time Away” to the fun-filled “The Pirate and The Princess” to the atmospheric “Frost” and the emotional storytelling of “Dark Night.” Each piece has a unique style and a colorful message. None of the six pieces are easy, but they are all worth the effort it might take to master them. The pieces are placed in the book by order of difficulty. There are some timing challenges here and there and a few pieces have more complicated key signatures. The only reaches of more than an octave are in rolled (broken) chords, so large hands are not required to play this music as written. The book itself is beautiful! 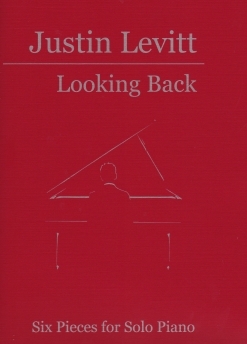 The covers are a gray linen-textured cover stock with silver type and an elegant silver line drawing of a pianist that is expressed with only a few lines. The book is in the traditional 9”x12” format and the music is printed on a creamy paper stock. The printing is clear, roomy, well-spaced, and very easy to read. 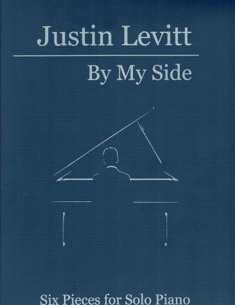 The books are stapled and are easy to keep open on the piano.